In 1997, Pocket Books pitched a line of books set in the Next Gen timeline with a fresh crew. The main writer, Peter David, has incorporated a variety of lesser-known characters, plus many references and cameos to 'big names' ones, but essentially stuck to this formula. 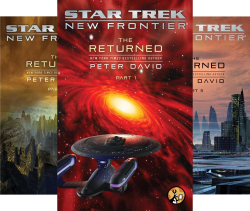 The line's included comics and short stories (not noted below where they aren't the focus of a book), and generally been well-received, and although PAD does veer into fan-fiction territory at times he's usually a solid bet for Trek fiction. Best advice is to start at the beginning, as the first six novels (books one to four have been reprinted as one volume) are amongst the strongest. Double Helix is a fun crossover with Next Gen, and after that your enjoyment is likely to be measured by how much you like the entire cast, because there's a tendency for subsequent books to concentrate on small groups of individuals. Or you could skip ahead to the short story collection No Limits and classic story Stone and Anvil. You may also be interested in tracking down the first print hardback edition of Stone and Anvil since it includes a CD containing most of the prior novels in PDF format, making it a very cheap entry point into the series.